Home Blitz News 20% OFF Everything At Blitz This Easter! 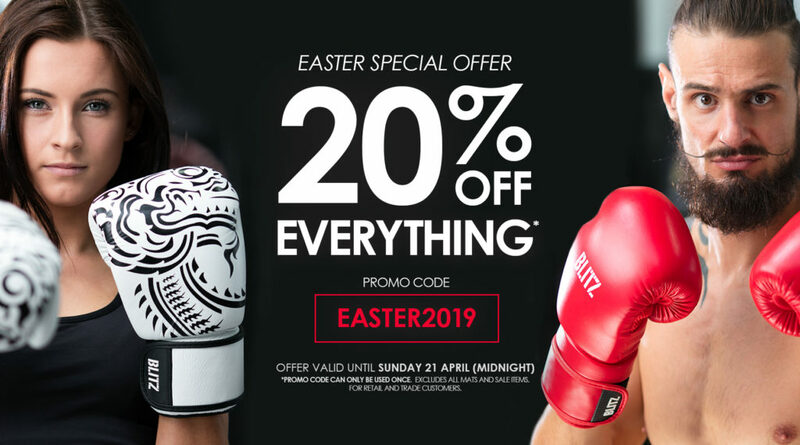 Join us this Easter holiday, with this incredible offer of 20% OFF everything* at Blitz! Grab a bargain on our brand new Martial Arts products including fitness equipment, body armour, strike shields, training aids and accessories; or, treat yourself to a new gi/uniform for the summer. Browse our complete collection at www.blitzsport.com and take advantage of our Easter special offer this week! For further assistance, please contact our friendly team on 0208 317 8280. Previous articleDo You Qualify For A Blitz Wholesale Account?